This little girl. I’m so very glad she’s mine and that she humors me and my crazy ideas. I’m feeling a bit guilty that I have so many beautiful portraits of her and so few of her brother but she’s game most of the time and he’s not. I have a feeling I’m going to have to resort to paying him with actual cold hard cash! For these I’ve been wanting to do a tee pee shot and had my husband buy me a bunch of dowels months ago. For a while I had them set up with a make shift canvas cover that they kids loved to play with. With the beautiful weather last week I was compelled to purchase the actual fabric that I wanted to use and actually construct the blasted thing. It’s kind of haphazardly thrown together but works just perfectly. A few lashings with some leather cord and the front of the tee pee was secured to the two front dowels. The tea party happened kind of organically. I originally had the rug in there and just her but then she started pretending it was a house so we ended up bringing out her dolls and the tea set. 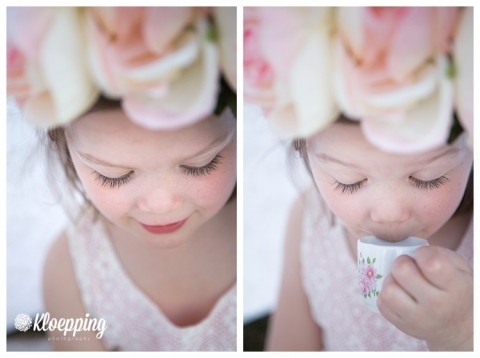 We had a full blown tea party with snacks and everything. Best part is that it’s not staged – she pulled everyone in and set it all up – just like she does when it’s set up in the basement. The giant flower crown is the one I fashioned for our last portrait session in the field but decided was ridiculously large. For some reason it worked well here. The second crown is one I found at Walmart at some point in time. It’s was a bracelet I think so I extended it with some leather lacing so it fit perfectly as a headband. In the end, I’m so thankful and grateful that she humors me. I know I shouldn’t expect it to last forever but I hope she never stops letting me capture how beautiful she is. My little muse….